As posted on Inside Halton, April 13, 2015. Retired Lt.-Col. Bill Sergeant has his parents to thank for his current travel itinerary. 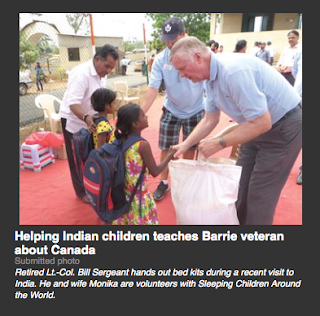 The Barrie resident has been to India four times in the past five years to volunteer with charity organization Sleeping Children Around the World. During his latest month-long venture with wife Monika, which wrapped up March 5, he helped deliver 6,100 bed kits to impoverished children. “It goes back to my parents in the mid-80s,” Sergeant said. Sleeping Children Around the World (SCAW) co-founder Murray Dryden had been on TV talking about the organization and, after watching it, Sergeant’s mom called Dryden at his Etobicoke home. She volunteered to be the organization’s secretary, but just before Christmas that year, was offered the chance to go to South America to see the work herself. In the army at the time, he would talk about his parents’ journeys. “I never had the opportunity to travel with them, but in 1997, my wife Monika had the chance to go to Uganda with them on one of the distributions,” he said. In 2007, the couple went on their first SCAW trip together to the Philippines. Three years later, Sergeant retired from the Canadian Forces, but worked as a reservist for 15 months. The couple has travelled to India every year since 2011, with Sergeant serving as team leader during the past three missions. He’s made several friends over there. “One individual got a bed kit 24 years ago in Mumbai and we now hire him to take us around on tours,” Sergeant said. That boy ran away from home because his father beat him and his siblings, and he and his sister were found living in a railway station by a Jesuit priest, who ended up taking them to an orphanage. Sergeant stayed in touch with the man through email, always using upper-case letters. Sergeant said it’s nice to see the children smile when he hands out bed kits. Since its creation, SCAW has donated more than 900,000 bed kits to children in 33 different countries. Sergeant appreciates the fact that 100 per cent of donations go toward buying the kits, which includes a wool blanket, plastic mat and kitchenware, such as a plate and mug or cup. “There’s zero administrative overhead. We pay for our own trips out of our own pockets, without the benefit of a tax receipt,” Sergeant said. Among the things he has learned through the trips is just how much Canadians have and how much we take for granted. “We have so many safety nets here, between food banks, welfare payments and so many charities that do help people in Canada. Over there, there are so few safety nets and charities,” he said.